The pain associated with migraines is the result of blood vessels & arteries being dilated (enlarged/inflamed). By inhaling Rosemary, it constricts the arteries & blood vessels which, in turn, takes away the pain and pressure. Rosemary acts as a vasoconstrictor, much like Imitrex & Maxalt. Warning! Not suitable for people with epilepsy, high blood pressure or pregnant women. Do not use with Lavender. 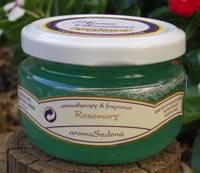 Directions: It is recommended to smell Rosemary continuously until the pain subsides.this normally takes 5-10 minutes. The pressure should gradually decrease. Put the open jar beside you for approximately 5 minutes; this will ensure the arteries remain constricted to reduce the chance of the pain returning. If migraines occur on a very frequent basis, you may use the Rosemary as a preventative measure by keeping it open on your nightstand each night and closing it in the morning. It is suggested that for the first month the jar be kept handy during the day to avert the onset of migraines. Travel/small size jars of Rosemary are available which are great to use in your car, office, or motel rooms. Warning! Not suitable for people with epilepsy, high blood pressure or pregnant women. Do not use with Lavender.